A senior Israeli Air Force official said Israel’s response in Gaza to the recent wave of rocket and mortar attacks has been aggressive, with airstrikes targeting key terror centers in the Strip, yet managing to avoid significant casualties in densely-populated urban areas. 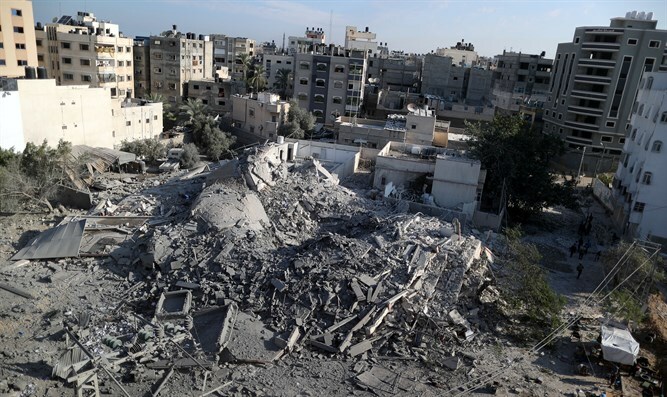 The officer compared the airstrikes to Israel’s responses to Hamas provocations during the summer of 2014, dubbed “Operation Protective Edge”. The pin-point strikes, the officer continued, require both accuracy and precision to avoid civilian casualties. While the IDF is working to minimize civilian casualties, the officer emphasized that the air campaign in Gaza was an “aggressive” response to Hamas’ recent wave of rocket attacks on Israel. The IDF declared earlier on Tuesday that the IAF has hit 150 terror targets across the Gaza Strip. The IAF officer said dozens of those attacks were carried out within a period of less than 120 minutes. Some 400 rockets and mortars were fired at southern Israel from the Gaza Strip since Monday. The IDF reported earlier Tuesday morning that it had struck some 150 terrorist positions across the Gaza Strip since last night.